Little Danish DANZKA elves called “Nisse” have brought Christmas magic into the TAX Free shop at Copenhagen Airport. 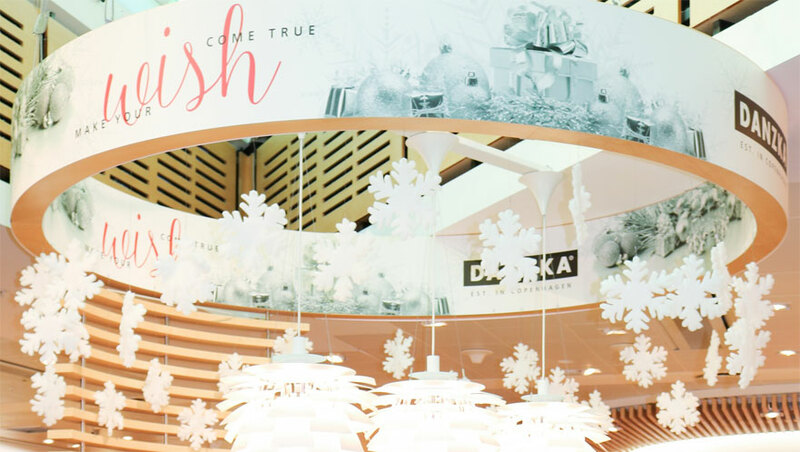 For the entire month of November, the largest of the six TAX Free shops at Copenhagen Airport will be staging an exclusive promotion themed on Christmas wishes, gifts and other winter pleasures in partnership with Waldemar Behn, producer of unique spirits. 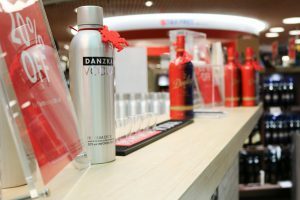 Travelers visiting the elegant DANZKA Vodka bar, which is located in a large promotional area, will be invited to sample various types of the premium vodka – either neat or mixed. Its unmistakable aluminum bottle is a Danish design-icon and is by the way not only made for fast cooling, but also lends itself to secure and light travel. What’s more, passengers can look forward to one of the world’s most awarded cream liqueurs: Dooley’s Original Toffee Cream Liqueur. The vodka-based cream, which blends Belgian toffee with Dutch cream, is best enjoyed neat or on the rocks; it’s also an insiders’ tip among cocktail aficionados. Because of its low fat content, Dooley’s makes an excellent basis for sophisticated cocktails and other long drinks. Throughout the campaign period, customers purchasing a bottle of DANZKA Vodka or Dooley’s will also receive a nicely gift packaging added by a traditional Danish Christmas hanger. But where is the DANZKA elf Christmas magic? All passengers passing by have the opportunity to leave one of their Christmas wishes in a box on the stage. At the end of the promotion one of the big or small wishes will come true. The current wishes range from spending the amount of 400 € to a charity organization, getting a new vacuum cleaner or enjoying a Dinner for two at NOMA in Copenhagen, World´s Best Restaurant honored with 2 Michelin Stars.